Sneaky sneaky...that's what I thought of this month's Sweet Adventures Blog Hop : Cake and 3 vegetables. The only vegetables I know used regularly in desserts are pumpkin, carrots and maybe a sweet potato or two. Hmm... perhaps something a little more challenging? How about eggplant? And no butter or shortening of any kind? Flourless? I recalled a recipe which I'd been meaning to try out but kept chickening out because it really had no butter, no flour, and used eggplant as the main ingredient. 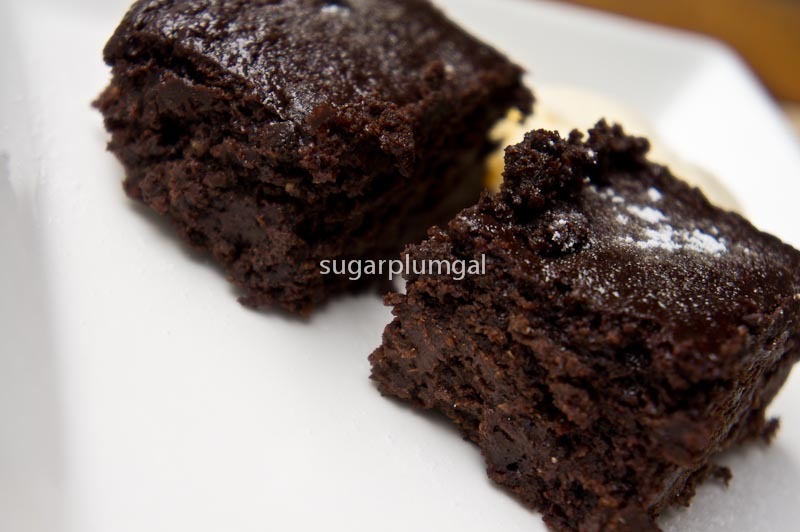 Eggplant Brownie, posted by Peaches and Donuts. Sounded too healthy to be baked into any dessert. And I must confess to being slightly sceptical. After all eggplant in its violent purple glory is best in curries or stir-fried with sambal or mashed into a smooth baba ghanoush. But, given that it is rather bland on its own and usually needs something spicy to zing it up, perhaps it would work in a brownie after all. So, enough contemplation and time to get to work. Baking out the Eggplant Brownie. The recipe is actually adapted from a Harry Eastwood recipe - originally for a chocolate cake, I think. However I agree with Peaches and Donuts that it is rather more brownie-like than cake. So that's why I'm calling it an Eggplant Brownie instead. eggplant or anything unorthodox. Just more soft and less structure than usual - I suspect because of its flourless, oil-free nature. No one suspected it was made of anything other than the usual brownie ingredients. Not one. Jaws dropped when announced the main ingredient was eggplant. 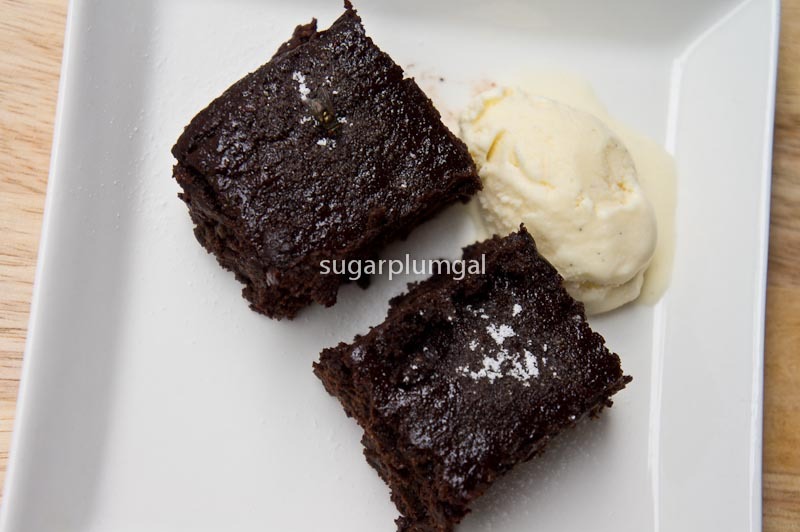 And for more brownie points *wink*, made without butter and flour. Serve it with some vanilla ice cream on the side. Be warned though, it is rather a messy recipe. On hindsight, I would have peeled the eggplants before cooking them, and melted the chocolate separately instead of whizzing it in the blender with the eggplant. Getting the eggplant-chocolate mixture out of the blender was tough as it was too thick. I ended up nicking my fingers on the blender blade. 1. Preheat the oven to 180C/350F. 2. Line the tin with baking parchment and lightly brush the base and sides with a little oil. 3. Steam the eggplants till soft or microwave them on high for 8 minutes. Drain any liquids away. 4. Cool them and peel the purple skins off. 5. Blend the eggplants and dark chocolate together until well mixed. It will be easier if you melt the chocolate in the microwave and then blend/mash the eggplant. Then mix the blended eggplant to the melted chocolate. 6. In a large bowl, mix the honey, eggs, cocoa powder, baking powder and salt together. Then stir in the eggplant/chocolate. 7. Pour into the tin and bake for 30 minutes (I had to bake it for 50 minutes). 8. Remove from tin and cool on a wire rack. Be careful, the cake is soft and tends to break off. 9. Serve on its own, or with some vanilla ice cream. I was hoping someone would use eggplant for this - love it!! Thanks! Luckily had this recipe saved up in my to-try list. Fascinating! I love the idea of this recipe, sorry to hear about your finger though - occupational hazard. Ouch! 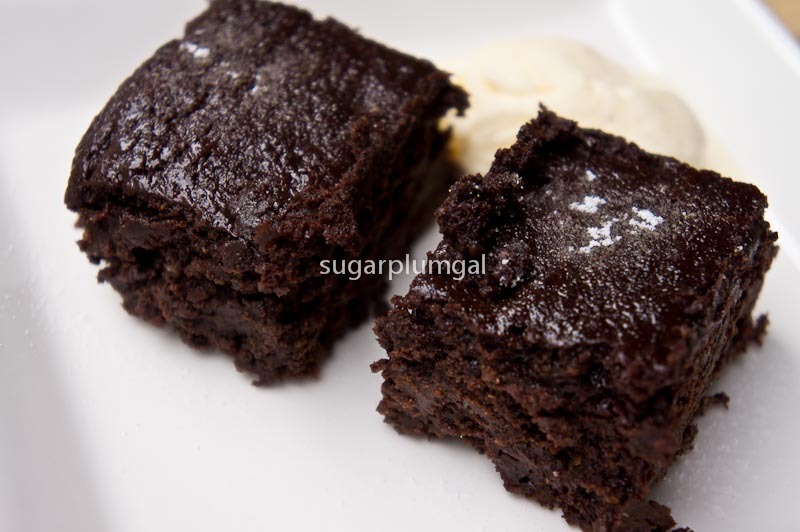 Hope your finger is feeling better - and at least you had these moist looking brownies to console yourself! Looks delicious! I will have to try and veganise this, have book marked it for some experimentation.